Tired of those cheap, flimsy magnets cluttering your refrigerator? The ones with the pizza delivery phone number or your local Realtor that can barely hold up even 1 piece of paper? Organize your refrigerator with our custom fridge magnets. Choose between 20 different glass colors so your magnet perfectly matches your fridge and room decor. Your fridge magnet can be customized with one of our 100’s of designs, making it beautiful and useful. Our strong refrigerator magnets have a clip that is able to hold 1.25 pounds without slipping, or around 200 pieces of paper. No more magnets sliding off the fridge! Use our magnets to organize party and wedding invitations, school handouts, recipes, family photos, bills, coupons, take-out menus, magazine clippings, newspaper articles and more. We had one customer write to us and explain how she uses our custom magnets to get her family organized. She got a message magnet designed with each of her children’s initials. She used that magnet to hold each child’s permission slips, birthday party invitations, homework calendars, and play dates. 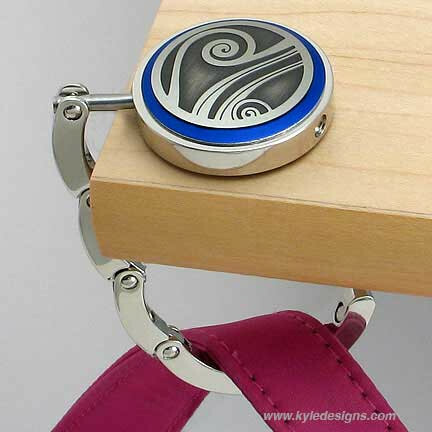 These cool magnets can be used on magnetic white boards. Great for teachers to use in their classroom to arrange handouts, dittos, permission slips and scratch paper. Your kid will love to decorate their locker with these magnet clips. They will be able to keep their homework, important papers and pictures of their friends secured to the inside of their cubby. How will you use our strong fridge magnets? John Leonard said that “It takes a long time to grow an old friend,” and while we couldn’t agree more, the same goes for the perfect bridesmaid gift. You’ve probably spent hours considering what to give your closest girlfriends, and for good reason; you want them to understand just how much they mean to you on your big day. Bridesmaids are not just your companions during the ups and downs of wedding planning, they are kindred spirits who are not only your support system, they are your life line as well. Whether you are planning a big wedding or small, a bride is always in need of some bridesmaid gift suggestions. We’ve all seen the the same ol’ tote bags, lotion gift sets and jewelry boxes that could swing it if you’re a last minute shopper, but for those who have time and want to find something extra special for their girls, we happen to have a few ideas for you. Wedding season is kicking off with the warmer weather and flowers blooming, and we here at Kyle Design couldn’t be more excited. It always brings a smile to our faces when a bride calls and places an order for bridesmaid gifts. One of our most popular choices by brides this year are our stylish and handy purse hooks. These sophisticated purse hooks are an ideal way to keep your purse off the ground to prevent it from getting dirty or stolen. Although compact, these clever devices can hold up to 25 lbs. and come with a free black velveteen pouch to complete your gift. Have it engraved with your bridesmaid’s initial, nick-name or full name for a unique touch. With the Royal Wedding countdown in the single digits now, we can’t help but get excited for Will and Kate’s big celebration. We can’t help but wonder what Kate gifted to her bridal party; perhaps a stunning piece of jewelry or maybe even a beautiful, handcrafted jewelry box. Whatever her choice, it’s nice to treat your bridesmaids like royalty so why not give them something they can use year round. 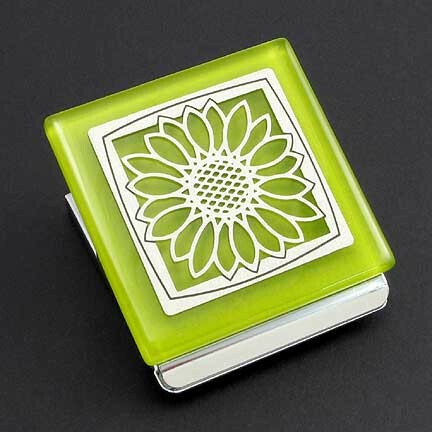 Engraved compact mirrors are a trendy and special present that goes a long way. We have even engraved some for a bride who was using the mirrors to ask her friends if they would be in her bridal party. Our engravable custom compact mirrors can be personalized with your bridesmaid’s favorite color, hobby, occupation or religious symbol. Each compact includes a regular mirror as well as a 2x mirror inside that comes with a small velveteen pouch to keep it safe. And for a guaranteed good time the night before your wedding or at the reception, gift your bridesmaids something they will truly be thankful for: custom flasks. While grooms generally order flask sets for their groomsmen, the times must be changing because more and more frequently we are engraving flasks for bridal parties. Whether you choose to have them engraved or not, these sleek flasks can also be personalized with the color and design of your choice. Your bridesmaid will appreciate having something that has been tailored to her taste and will definitely use it for post-wedding girls nights out! Ease your little ones into a restful nights sleep with our unique decorative night lights. Use our new baby night light to softly brighten the nursery so you can carefully and quietly check on your newborn infant throughout the night. Will also light your steps during your late night feedings in the babies room. A night light in your child’s bathroom will illuminate their path and guide your sleepy toddler safely to the toilet during potty training years. 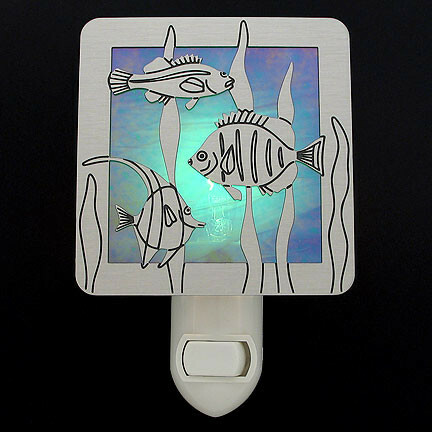 Use our tropical fish night light to create an “under the sea” themed childrens bathroom that will encourage them to use the restroom throughout the night and avoid having any “accidents” in their bed. Establish a seamless bedtime routine for a child who is afraid of the dark by turning on a night light that will lighten your children’s bedrooms to allow them to securely fall asleep with no fear of the boogeyman. We have night lights that will compliment any girly bedroom decor. Perfect for your little princess. To create an adventurous room for your little guy, we have many designs that will excite your son about his bedroom or playroom. 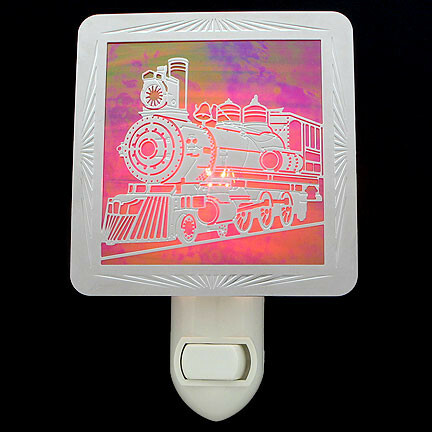 Our train night light is perfect for any little boy who loves to play with his toy train set or grow up to be a conductor, choo choo! 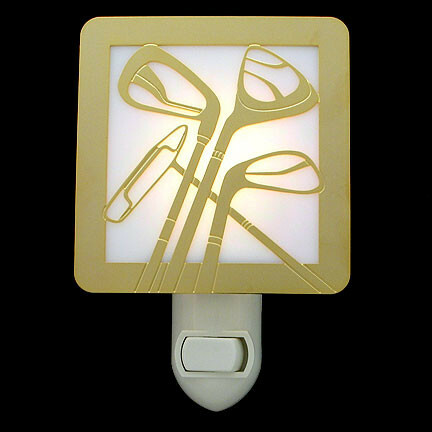 Choose a night light with your little boys favorite sports. Maybe choose dads favorite sport of golf for the boy who wants to be just like daddy. 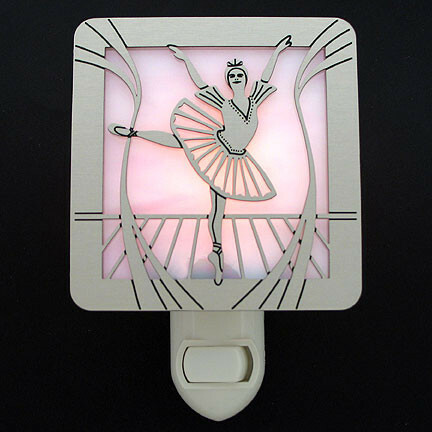 Customize our children’s night lights by choosing these or any of our other 100’s of night light designs. 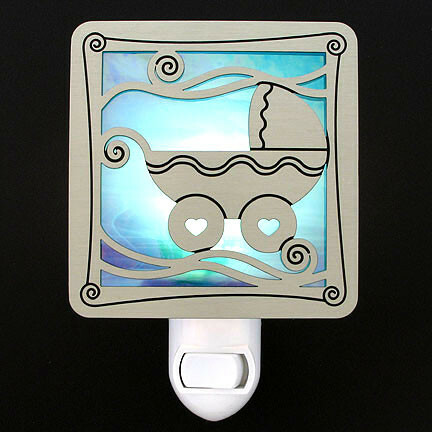 Personalize your baby room night light with 9 stained glass colors, 4 design metal finishes, and 5 night light bases. Sure to be the finishing touch in your child’s bedroom. With Mother’s Day just around the corner, why not take a moment to think about what makes your mother so special. According to our calendar, Mother’s Day is only celebrated once a year, but many of us think of our mom’s year round. Whether it’s just a phone call to check in or a surprise gift in the mail, mom’s appreciate any gifts from their children, tangible or not. But rather than recommending a D-I-Y macaroni necklace or an origami lotus flower, we’d like to suggest that this year you honor your mom with something special. There is no better way to achieve this than to think outside the box and find a gift that is uniquely customized to suit her taste. Personalized Mother’s Day gifts are a warming touch and show that you went that extra mile to make Mother’s Day memorable. If your mom loves to bury herself in a good book, consider a lovely custom bookmark engraved with a sentimental Mother’s Day quote, her name or a personal message from you to her. These bookmarks can be customized to feature her favorite colors and a design that represents her favorite hobby. She’ll love how easily this slips in between the pages of her book and think of you each time she saves her place. For an elderly mother, surprise her with a gorgeous and useful pill-box or vitamin case that will help her stay organized. She will be the envy of all her friends when she takes out this meaningful yet practical Heart Vitamin Case. Customize it with her favorite color and metal to show her that you know more about her taste than she thinks. If she takes multiple medications on a daily basis, perhaps a lovely Sewing Pill Box will help her compartmentalize her doses. Forget about cheesy plastic pill containers, she will be proud to carry and use this sweet memento from her children and serve as a constant reminder of your love for her. For mother’s who love interior decorating or have an outdated night light that has seen better days (you know which ones we’re talking about), treat her to a gorgeous stained glass night light that will illuminate her bedroom or bathroom in elegant style. Our iridescent stained glass and quality etched metal designs will reflect her personality and make her smile for years to come. We love to help make mother’s feel special year-round, but Mother’s Day is the one day that children have the pleasure to give back to the women who gave them the ultimate gift – the gift of life. 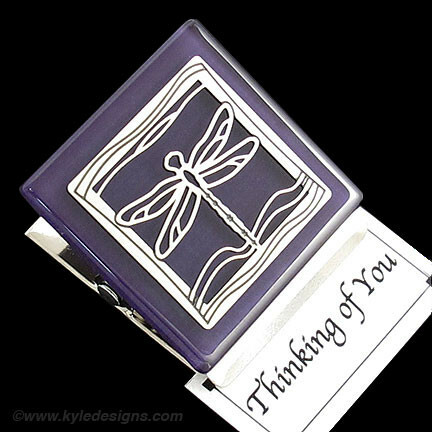 For more great gift ideas for every occasion, visit us at Kyle Designs.